Giving birth is more difficult--and dangerous--for modern humans than for any other primate. Not only do human mothers have to push out babies with unusually big heads, but infants also have to rotate to fit their heads through the narrow birth canal. Now, a new virtual reconstruction of the pelvis of a Neandertal woman suggests that Neandertal mothers also had a tough time giving birth to their big-headed infants--but the babies, at least, didn’t have to rotate to get out. Once upon a time, a major shift took place in the evolution of childbirth. Fossil female pelvises of a 1.2-million-year-old Homo erectus, a 3.1-million-year-old australopithecine, and a 500,000-year-old archaic modern human all contain oval birth canals that are widest transversely--from side to side--when viewed from the top. But modern women’s birth canals, though also oval, change shape halfway down the birth canal so that they are widest from front to back at the bottom, near the pelvic outlet. This means that the baby has to rotate its head to fit as it moves through the birth canal. If a baby fails to rotate, another part of its body, such as its shoulders, hands, or feet, may obstruct the birth canal, which is painful and dangerous for the mother and infant. Like many other researchers, paleoanthropologist Timothy Weaver of the University of California, Davis, thought the shift to this more complicated rotational birth predated the split between modern humans and Neandertals. That’s because Neandertals, which lived until 30,000 years ago in Europe, also had big heads and, presumably, used the same evolutionary strategy to deliver their big-brained babies. But it has been difficult to test this idea. The only known female pelvis of a Neandertal, discovered in 1929 near Tabun, Israel, is fragmentary. Two earlier reconstructions of this partial pelvis suggested that Neandertals also had rotational birth, but the fossil is missing its sacrum and, hence, the birth canal. Now, new tools have given Weaver a way to work around that problem. Collaborating with Jean-Jacques Hublin at the Max Planck Institute for Evolutionary Anthropology in Leipzig, Germany, Weaver got permission to make computed tomography-scans of the pelvis, which is kept at the British Museum in London. The two researchers were able to refit the pieces of the pubis, ischium, and ilium together in a three-dimensional, virtual reconstruction. They also used landmarks on the pelvic fragments to compare the pelvis to those of modern humans--and to predict the size and shape of the missing pieces, such as the sacrum and dimensions of the pelvic outlet. The reconstruction suggests that the pelvis of the Tabun Neandertal was widest from side to side all the way down the birth canal, more like that of Homo erectus or australopithecines than modern humans. And that means that although Neandertal mothers still had difficult births because of their babies’ large heads, their babies did not rotate in the womb, the team reports online today in the Proceedings of the National Academy of Sciences. So why would our ancestors evolve such a complicated birth in the first place ? Other research shows that they had to balance pressures to adapt to the hot climate in equatorial Africa--and tall, slender-hipped humans thermoregulate in the heat better than short, stocky humans (whose physiology retains heat better in the frigid latitudes). By evolving a birth canal that is wide front to back, our ancestors were able to accommodate both narrower pelvises and the delivery of big-brained babies, suggests Weaver. But it will take more than a virtual pelvis to convince other researchers. "I don’t know if I believe the reconstruction," says paleoanthropologist Karen Rosenberg of the University of Delaware, Newark. She and others have questions about the accuracy of the reconstruction of the missing parts of the pelvis, which are critical for proving there was no rotation. "Given the poor preservation of the Tabun pelvis, ... this is a bold claim," says anthropologist Marcia Ponce de León of the University of Zurich in Switzerland. She does agree, however, with one conclusion : "Birth was equally difficult in Neandertals as in modern humans," with or without a twist. Twist and shout. 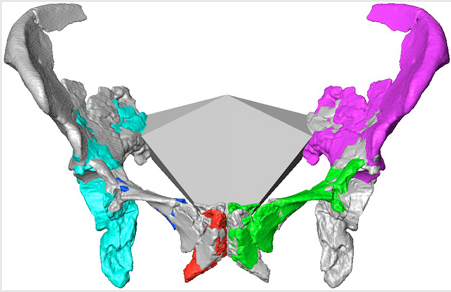 This virtual reconstruction of a Neandertal pelvis suggests that Neandertal babies didn’t rotate during birth.